Save with our bundle of premium baking essentials! Ooey, gooey sticky buns at home. Bake our favorite foolproof Ridiculously Easy No-Knead Sticky Buns. 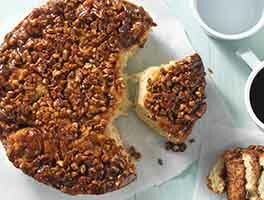 To make the recipe easily at home, we've bundled our 9" Round Pan with 3 key ingredients: Sticky Bun Sugar, Baker's Cinnamon Filling, and SAF Red Instant Yeast. We've included a printed recipe to make it at home.